About 42 years ago, in 1976, a film made by this writer screened in the country and at overseas film festivals. The English version of the film was named Beyond the Last Mountain (BTLM). An Urdu version was called Musafir. The film, which had shunned offers of financing from the state-owned National Film Development Corporation (Nafdec, then led by an exceptionally cultured managing director, Khawaja Shahid Hussain) in order to avoid any possible official control of content, and from commercial financiers only interested in profits, managed to complete a combined 25-week Silver Jubilee run in cinemas. Majeed Ahmed, now deceased, my immensely gifted partner-art director in our advertising firm, MNJ Communications, had sportingly agreed to co-invest in the film with me. Our goal in making the film, was to score several “firsts.” BTLM was the first Pakistani film in which talented women from diverse disciplines, who had never previously acted in a film, essayed the lead roles. The mode was low-key and realistic instead of the melodramatic, high-pitched norm. Spectacular action in some scenes, requiring complex logistics in production, was also effectively achieved. Distinctive background music included the first-ever use in a Pakistani film of a harpsichord specially imported for the film from London. Of three musical sequences, Urdu lyrics were lip-synched on screen in only one to celebrate a pre-wedding mehndi. Filmed entirely on location, BTLM was able to reflect the look and feel of Pakistan in the mid-1970s with the introduction of a new cast of gifted actors and dozens of lay citizens rather than professional extras in group scenes. Other firsts included a young new crew behind the camera, some innovative features in filming techniques and promotion, portraying some social, cultural practices no longer publicly seen in the country. However, over the past four decades, almost all of the celluloid prints of the film have either been lost or damaged. This was primarily due to my own indefensible negligence, and some other reasons better left unnamed. Only about 75 percent of the film was transferred on to video tape for preservation. But in 2018, a small number of American citizens, who have no prior association with Pakistan or this filmmaker, are voluntarily striving to preserve, restore and digitize what is possibly the only complete print of the English version, which has survived intact. They personify some of the finest virtues of the vast majority of the American people — warm, friendly, helpful. How this has come about is a story in itself. 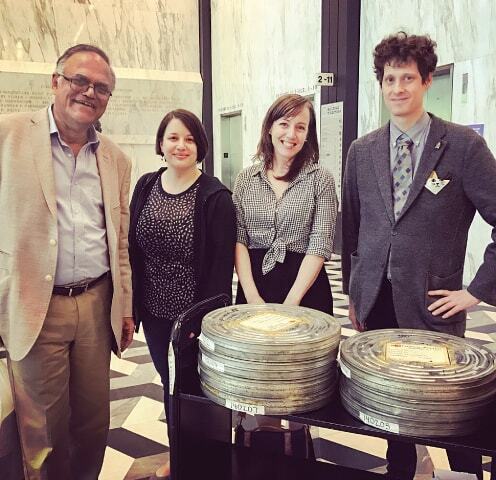 In January 2017, shortly after being appointed to her present position, Bonnie Marie Sauer, Director, Archives and Records Management of the Lincoln Centre for the Performing Arts (LCPA), New York asked intern Becca Bender, an NYU film graduate, to examine all the stored material. This entry was posted on Thursday, January 17th, 2019 at 00:01	and is filed under Uncategorized. You can follow any responses to this entry through the RSS 2.0 feed. Both comments and pings are currently closed.